Copy the log in code shown above. Start TrackMania Nations Forever (or TrackMania United Forever). At the main menu, select "Explorer". Erase the URL at the top of the screen. Paste the log in code shown above into the URL text entry box. Press key to join the server. Server is currently not running. Please post a message in our forums, in case we don't know about it. 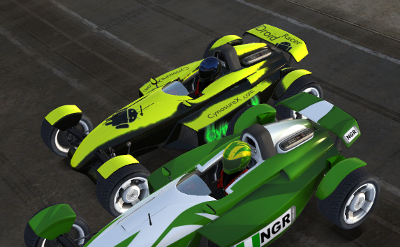 Recently, with the lost of sponsorship, Nadeo, the company that created TrackMania Nations Forever, has made it increasingly more difficult for free players to play online. In fact, free players are required to sit out and spectate one race for every five races played when playing on the FreeZone servers. That really tarnishes the community. Therefore, we decided to strengthen the community by creating a free server. It is completely free to play on, without the need to sit out any race. The server is not visible on the server list. To join this server, use the log in code at the top of this page.